New high resolution radio observations from the European Very Long Baseline Interferometry Network (EVN) and the UK’s Multi-Element Radio Linked Interferometer Network (MERLIN) have probed the famed green cloud of gas known as 'Hanny's Voorwerp'. 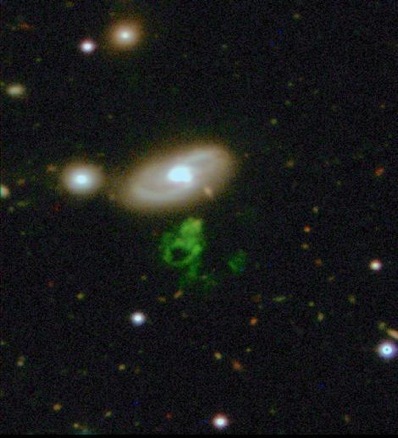 Hanny's Voorwerp, the green blob of gas in the centre of this image, sports a 16,000 light year diameter hole, and was discovered by Hanny Van Arkel as part of the Galaxy Zoo project. Image: Dan Smith, Peter Herbert, Matt Jarvis & the ING. Hanny's Voorwerp was named after Dutch school teacher Hanny Van Arkel who identified the curious object while classifying galaxies as part of the Galaxy Zoo online citizen science project. The green blob of gas lies near the spiral galaxy IC 2497 but does not contain any stars itself. It also sports a 16,000 light year wide hole in its centre. Radio observations of galaxy IC 2497 reveal two compact sources, signalling the presence of an active galactic nucleus, and smooth and extended emission implying a starburst region. Image: ASTRON. Garrett and his colleagues believe that the radiation output from the AGN is heating Hanny’s Voorwerp to a temperature exceeding 10,000 degrees. The plot thickens with the observation of extended radio emission, suggesting intense star formation. “We knew that IC 2497 is forming stars, but we were surprised to find that the star formation seems to be concentrated in a very small central region, only 3000 light-years across,” says Hayden Rampadarath of the University of Manchester. The observations show that IC 2497 is spawning stars with a total mass of 70 Suns per year in this condensed central region, a rate about six times higher than the nearby starburst galaxy M82. It is quite unusual to find such concentrated and intense star formation alongside AGN radio activity, and both on similar scales, too. “It seems that IC 2497 swings both ways,” comments Garrett. 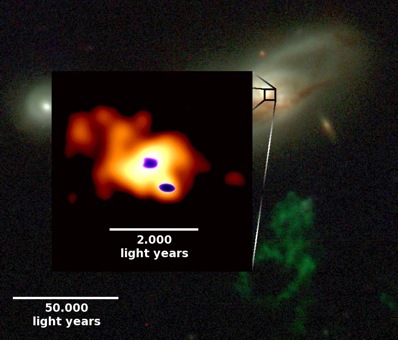 The new observations support initial theories on the nature of Hanny's Voorwerp as a region of gas ionized by IC 2497's AGN, perhaps only visible because of the specific geometry of the galaxy, gas and us, but further data recently derived from the refurbished Hubble Space Telescope is expected to shed even more light on this fascinating object in the weeks to come.